It's my day to share something with you for the Modern Mini Challenge that Jennifer is hosting over at Ellison Lane Quilts. 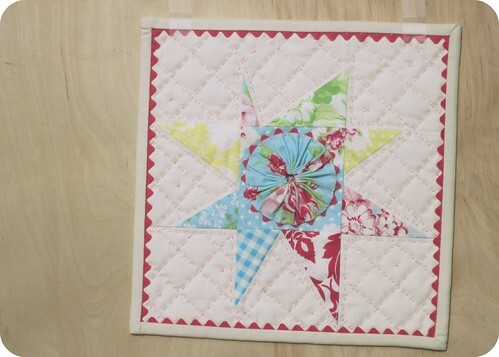 I told myself that I wasn't going to make something new for today, but earlier this week I came across this wonky star block that I made several years ago. I decided to see what I could do with it instead of throwing back into the scrap bin. It turned into this little mini quilt (it's about 10.5" square). I seem to be experimenting quite a bit with rick rack lately... and this one got all doctored up with rick rack in the binding and around the edges of the yo-yo. Do you ever think about the practicality of some of the things that you make? I always want to make something that will be useful to me or someone else and I have a hard time making things like this little quilt because it's really not my style and I don't know what I'll do with it. But, I really did enjoy the process of making it and experimenting with different techniques and ideas. I suppose that's part of the fun of being creative. I just have to not worry about how useful something will be in the end and just enjoy the process of making it. 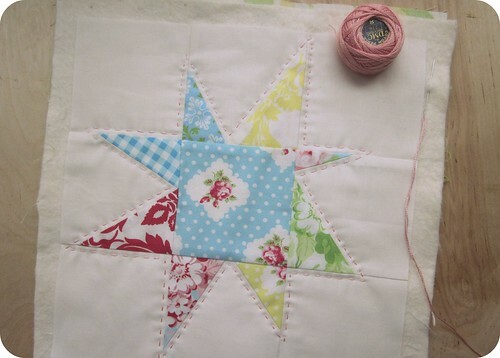 So, here's where I ended up with this mini quilt! It really was enjoyable to work on something small and I'm really pleased with how the rick rack in the binding turned out. Someday I'll try that on a larger quilt. 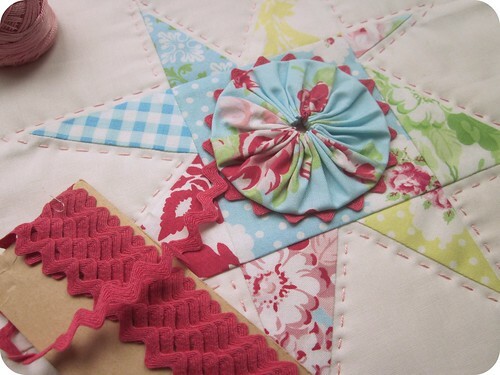 I hope you're inspired to make a mini quilt just for fun, too! Jennifer has lots of information about the Modern Mini Challenge here. There's a contest going on... and prizes (umm... you could win some of the Flea Market Fancy reprint by Denyse Schmidt!)! Such a pretty mini and love the hand-stitching. So happy to be sharing today`s blog hop with you. Holy crap, that's gorgeous! You put so much thought, creativity and love into this mini, I LOVE it!! this is so cute. i love the cross hatch hand quilting!!! that is beautiful! i particularly love that it developed from something that wasn't being used! 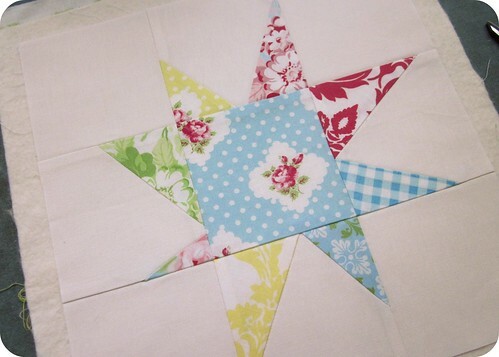 i have a lonely quilt block that i may need to do the same thing with...maybe a potholder?! How cute! 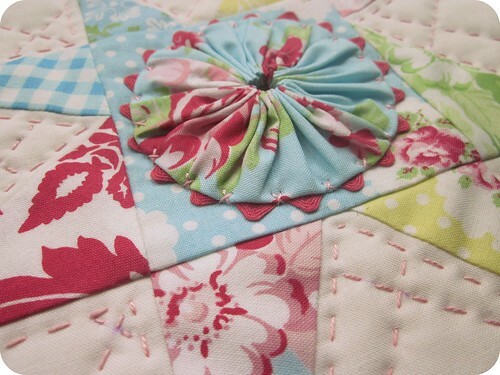 Love the yoyo and the quilting to the whole. Great! 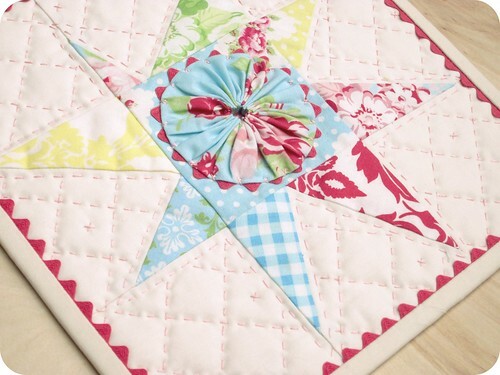 Love your hand quilting on this! Its so full of texture!! Maybe you could give it to a sweet little girl for a doll blanket? One of my great aunts -- long gone for many years now -- made me a couple little quilts for my dolls when I was a youngster (49 now!) and I still have them! This is so pretty. I like all the little special elements; the yo-yo, the rick rack, the hand quilting. But I agree, I always want to make something useful and sometimes just need to relax and sew. Have fun. Thanks for sharing this mini. The hand-stitching is darling. And I'd love to know how you did the rick rack in the binding. I have a quilt I'd like to try that on. Is it jumbo rick rack (like you can buy at JoAnn's) or is it special order? Great inspiration - can't wait to get started on mine! Jessica-awesome, as usual! I agree with you on the making something useful part. I like thinking about how something will be used as I'm making it - motivation to keep going until its finished! So sweet! 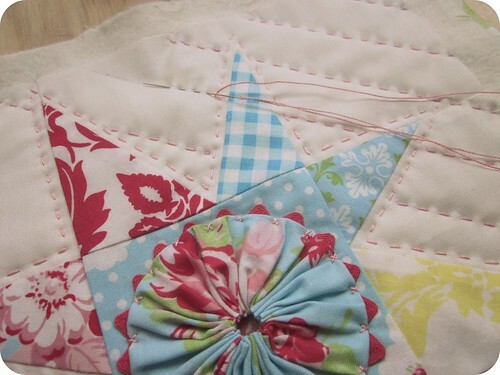 The hand quilting and rick rack give it and extra special touch. I need to did into my forgotten blocks and put them to use. Oooo! I LOVE the little ric rac in the binding detail. Love this-so cute with ric rac! I love how that stitching it looks really cool. 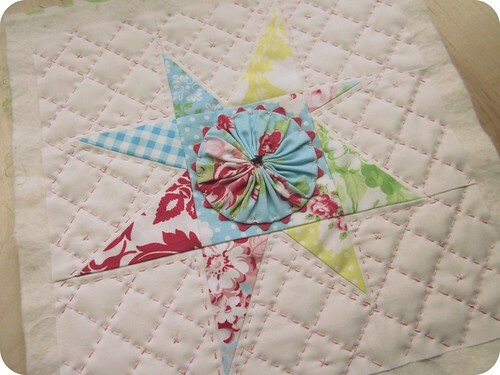 Wow that little quilt just kept getting cuter and cuter as I scrolled through the pictures. Great job! It's darling! Gorgeous mini! Love all the details in this quilt. Thanks for sharing the process! That's beautiful, and I love seeing the construction process. I'm afraid of hand quilting for fear I will ruin it!! This is amazing. what a cute little mini! i'm in the same boat. my stuff needs to be practical. but then again it IS fun to play on a smaller scale, too. so i know exactly what you mean! 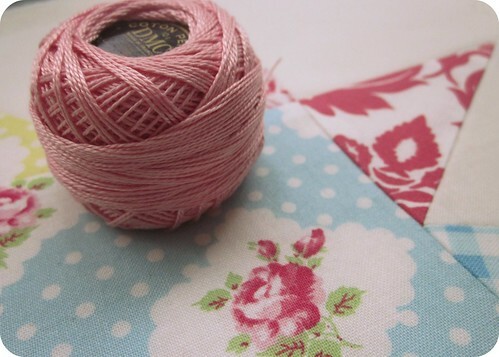 love your hand stitching and the ric rac! 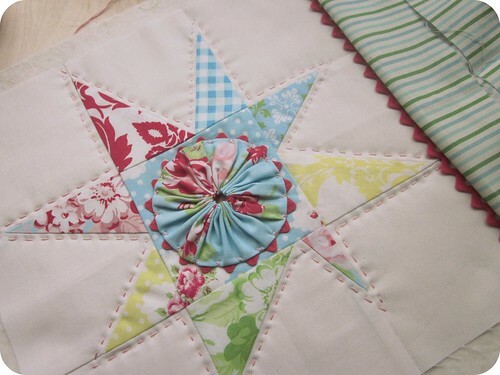 Such a darling way to set off the center of the star--love the yo-yo with the ric rac! Here in the good 'ol USA, it's hard to find good ric rac lately; sigh. I have a bit of an old stash albeit it's the 1/8"--will have to search some thrift shops.